If you have the type of feet where you need the constant support of insoles then Best Insoles, online at BestInsoles.com, is the perfect store for you. 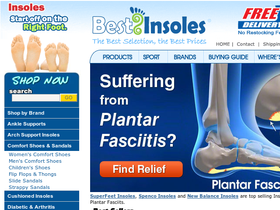 Best Insoles is committed to providing its customers with comfortable, reliable, and supportive insoles. Choose from a variety of insoles with Best Insoles, including arch support insoles, cushioned insoles, sport insoles, and industrial insoles. You’ll even find a selection of foot health products and even sandals, shoes, and socks that are perfect for the health of your feet. Best Insoles only offers the best brands among which are Spenco Insoles, Superfeet Insoles, Lynco Orothics, SofSole, Sole Ultra Insoles and so much more. So get the perfect insoles for your feet at Best Insoles. But remember to stop by RetailSteal to get great Best Insoles coupon codes, Best Insoles discounts, and Best Insoles promotions. Best Insoles primary shipping method USPS Priority Mail, or First Class “tracked” delivery. Most orders are estimated to arrive within 7-10 business days. International shipping is available. See website for full details, exclusions may apply. Shop at Best Insoles and enjoy 10% savings on all orders. Click here for code. Use this exclusive RetailSteal coupon code on Best Insoles to get 10% discount and free shipping. Save 5% on New Balance Insoles from Best Insoles when you use this coupon code online. Click to save. Use our coupon code at Best Insoles today to save 5% on Superfeet insoles online now. Shop the Sale at Best Insoles to get up to 40% savings and free shipping on select items. Shop online at BestInsoles.com and enjoy free shipping on any order. No minimum purchase required. Get a 3% discount on arch support insoles when you buy 3 or more at Best Insoles. Click link to shop online. Shop online at Crocs.com for Cyber Monday and enjoy 40% off your entire purchase. Shop online at Crocs.com and enjoy these special Black Friday offers. Click link to shop and save. Use this coupon code online at Crocs.com and enjoy a 10% discount on your entire order.